When Veronika submitted her design for this issue, we were totally thrilled - especially her design was this cool vest, reflecting her love for the simple, clean lines and shaping of leather motorcycle jackets. The asymmetrical zipper adds the true moto touch while the slipped stitches in the front panels catch the eye and slim the frame. 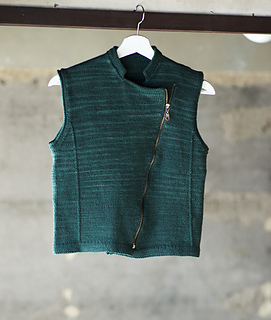 Knit at a tighter than usual gauge, the fabric is warm and sturdy, but the sleeveless aspect allows you to wear it layered for the transitional seasons. Constructed from the bottom up, there’s also very little finishing. The perfect companion for knitting or wearing on the go! The sample was knit in size S with 11⁄2” / 4 cm positive ease. Stitch markers (2), tapestry needle, waste yarn, approximately a 17-22” / 43-56 cm separating metal zipper depending on the length of your right front edge, matching thread to sew on zipper and sewing needle. 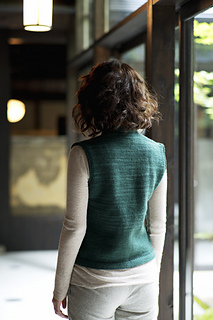 Vest is knit at in one piece from the bottom up. The left front is split while working to leave an opening where the zipper can be inserted into the middle of the work. Joined back together at the top of the vest, it is nished at the shoulders and then seamed. ベストは裾から往復編みで,前後身頃一緒に編み進める. 左 前身頃にファスナーを縫い付けるためのあきを残して身 頃と下襟を分けて編んでいく. 肩で前身頃と後ろ身頃とは ぎ合わせ編み終える.